Witnesses told investigators Phillips either swerved to avoid an opening door of a sport utility vehicle or was actually struck by the door and thrown into the path of the truck. One nearby resident told reporters the Cambridge intersection has been a huge problem for decades, and it’s gotten even worse as the number of bicyclists has ballooned in recent years. The day before the crash, the Cambridge Traffic, Parking & Transportation Department hosted a public meeting to talk about the Inman Square intersection safety. The city’s presentation revealed there were nearly 70 accidents just at that intersection alone during the five years between 2008 and 2012 – with 15 of those being bicycle accidents. Those at the meeting posited a number of possible fixes, including altering the patterns of traffic to help alleviate some of the congestion and make it easier for bicyclists and pedestrians to traverse the area. Some residents are doubtful there is much that can help, given the sheer number of vehicles – cars and bikes – moving through that intersection all the time. And it’s so true because at the end of the day, every single one of these bicycle accident deaths was preventable. There have been five such vigils hosted by the same group in Boston since last year. 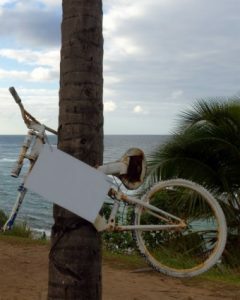 However, the group didn’t create the ghost bike for Phillips. Instead, it appeared at the intersection the same day she died. No one is sure exactly who put it there. The ghost bike tradition isn’t entirely new. It’s been around since at least the early 2000s, and has mostly arisen organically following a tragic bike accident. These events speak to the close-knit bicycling community. For example, following the deaths of five riders and the injury of four others in a single accident in Michigan, some 70 riders in Boston turned up for a ride of silence to honor the victims. Mourners said they attend these events hoping this one will be the last. But then just that very same day, a 15-year-old suffered serious injuries in a Dorcester bicycle accident.